More and more people are beginning to realize that education needs to continue throughout life. As individuals and collectively, we face the choice of either staying as we are, or striving constantly to develop. 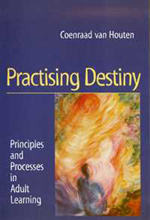 Over decades of seminars and training work, Coenraad van Houten has developed three paths of learning for adults, each involving its own distinct method: Vocational Learning, Destiny Learning and Spiritual Research Learning. Although quite separate, the three paths are closely linked, with each building on the previous one. This book depicts the sevenfold path of Destiny Learning. It is a path that leads through working in groups to a practical knowledge of karma. In addition, the seven professional fields of the adult educator are developed and described as an aid to self-training. COENRAAD VAN HOUTEN was born in the Netherlands in 1922. After studying Chemistry, Economics and Social Pedagogy, he lived and worked in Holland, Indonesia, Hong Kong and Britain as a manager in business, as a consultant, and as the director of the Centre for Social Development (which he co-founded). He has developed specialist programmes and seminars for educating adults, and presently advises organizations on training programmes. He is the author of Awakening the Will, and the co-founder of the New Adult Learning Movement.